Rich and Jan are specialists in Thousand Oaks real estate. They are committed to making every aspect of their clients move, a pleasant experience. 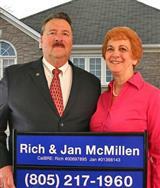 Rich is a highly successful real estate professional since 1978. Rich received his Brokers License in 1984. He has had the privilege of serving the needs of thousands of Conejo Valley homeowners for over 30 years. After college, Rich entered the military and was stationed in Fort Hood Texas and Tue Hue South Vietnam. As a communications specialist Rich rose the ranks to sergeant. He feels his Army years gave him a unique prospective on life and helped develop his communication and management skills. After his honorable discharge from the Army, Rich went to work for ITT Continental Baking Company in Los Angeles and rose the ranks to office manager overseeing 30 office staff. He than moved to Olga Company in Van Nuys joining the financial staff as an accountant. Rich attributes his finance training with helping him assist his clients with the sometimes confusing and constantly changing mortgage loan industry. In 1978 Rich decided to enter the world of real estate. Rich’s real estate career has included ownership of two major real estate companies; Century 21 America in Thousand Oaks and Century 21 Channel Islands in Port Hueneme. He has also owned and managed a Finance company; American Consumers Financial Corp. and a real estate training company; Real Estate Education Center Inc. Rich has also managed two Coldwell Banker offices in Moorpark and Simi Valley. In 1999 Rich decided to dedicated the remainder of his real estate career to his clients. “Our only goal is provide exceptional and quality service to our clients,” says Rich. Rich is a Graduate of Realtors Institute GRI; Certified Residential Specialist CRS; Senior Real Estate Specialist SRES; Accredited Staging Professional ASP; Accredited Buyer Representative and Internet Professional e-Pro. All designations from the National Association of Realtors. Provided to only the top 2% of real estate agents Nationwide. Jan Novelli McMillen is a graduate of University of La Verne. She began her career in real estate as a Business Manager for a local residential and commercial developer, Raznick and Sons, about twenty years ago. She was part of the accounting team for new projects and she managed completed projects until they were sold. She became the Financial Manager at the Anden Group where her emphasis was on budgets and technical support for the introduction of computers into the workplace. Jan spent almost ten years with Capri Properties as the Controller and Office Manager for a firm that engaged in property management, HOA management, commercial and residential sales, as well as consumer mortgage brokerage. She spent a few years as a Division Controller for Stewart Title in Westlake Village before joining her husband Rich McMillen at Century 21 Rolling Oaks and subsequently Aviara Real Estate. Jan has received the following international real estate designations: Graduate of Realtors Institute GRI, Senior Real Estate Specialist SRES, Accredited Staging Professional ASP, Short Sales and Foreclosure Resource Certification SFR and Internet Professional e-Pro. All designations from the National Association of Realtors. “We strive to make every real estate transaction a pleasant experience,” says Jan.
Rich and Jan are proud parents of six children; Richard Jr, Michelle, William, Isaac, Ann and Christi. They have been blessed with fifteen grand children. Real estate is a people business. Selling or buying a house is perhaps the single largest transaction most of us will make in our lifetime. Rich and Jan strive to keep your transaction as simple and worry-free as they can. Organization and communication skills they have developed over the years help them keep you informed throughout the entire process. Rich and Jan’s approach to life is as classic as their style of service. Because they feel so strongly about this beautiful community in which they live, they support various charitable organizations; incluiding Manna Food Bank, Easter Seals and Susan B. Coman's walk for the cure for breast cancer. Rich and Jan’s consistent high level of real estate production translates into plenty of satisfied clients and referrals. Their attention to detail and unsurpassed communication skills, allow them to be Top Producers and still provide an efficient, yet personalized, service. We have won several top Realtor awards, but a single referral from a satisfied client far outweighs any award we have ever won. says Rich and Jan.